For many expectant couples, the ideal babymoon package combines a relaxing setting with a little romance and some serious pampering! Our featured Missouri babymoon packages offer all that and more. The stately Fleur-De-Lys Mansion is a wonderful setting for a romantic babymoon retreat. Located in Historic Compton Heights, it is set amidst beautiful, historic parks and a multitude of fine dining and entertainment options. Enjoy a full gourmet breakfast before you set out for a day of exploring the local attractions. Or, just simply spend time relaxing in the mansion's spa room or garden patio. A Little gift for your baby! Available separately is a romantic horse drawn carriage ride. Your private ride will meander through historic Tower Grove Park's 289 acres of greenswards, featuring bronze statuary, fountains, lily ponds and fanciful pavilions. Then, return to the Inn for a sumptuous four-course dinner, selected by you from the chef's delicious seasonal offerings. Very romantic! 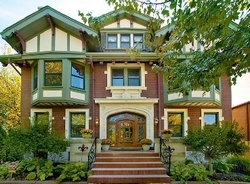 Billed as one of the most romantic getaway locations in the Kansas City area, this elegant bed and breakfast inn is the perfect venue for your pre-baby vacation. The Inn on Crescent Lake sprawls across 22 acres and is surrounded by two crescent-shaped lakes from which it gets its name. Guests enjoy walking trails, fishing, paddle boating, and swimming in the over-sized pool. Theaters, museums and professional sporting events are only 30 minutes away in downtown Kansas City. Each of The Inn's 10 guest rooms and suites are uniquely decorated. For the ultimate in privacy, check out The Tuscany Suite or The Cottage - a restored 1915 carriage house. 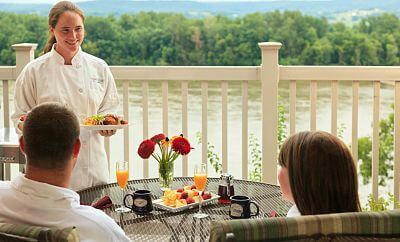 Located in scenic Hermann, the Hermann Hill Inn is an upscale spa resort, offering concierge services and luxurious accommodations. 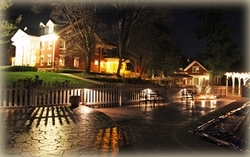 There are many unique features that make this inn particularly ideal for a pre-baby getaway. One is the 'Forest of Gongs' - an array of gongs, each representing a word to describe your relationship with your partner (eg romance, soul mates etc). Choose the gong that best suits your relationship, then strike it with a rubber mallet for each year of your marriage. The echoes of the gongs can be heard across the valley and town of Hermann, creating a special moment you will never forget. There is also a Private Chapel, which you can use to reflect on your relationship and the exciting changes in store with the birth of your baby. Or you can simply take in the majestic views and sunsets from the the popular 'Celebration Point'. Use of a large comfort pillow.